In this episode of the TiLT Parenting Podcast, I talk with Samantha Ettus, a renowned work/life balance expert, author, radio show host, and media personality. Sam is passionate about helping people, and especially moms, find create a more fulfilled, healthier, and more satisfying life. She writes about her ideas in her new book The Pie Life: A Guilt Free Recipe for Success and Satisfaction. 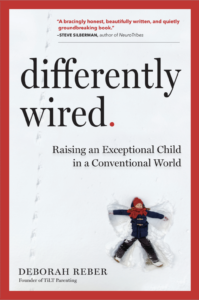 I was excited to talk with Sam about her new book and ideas behind what she refers to as “embracing the mess and bumps” that come hand-in-hand with living a truly fulfilled life, since messiness and bumps seem to a part of any parent raising a differently-wired kid’s experience. In our conversation, we talk about everything from self-care and intentional parenting to getting our partners up to speed since often moms seem to be the ones holding onto a lot of the information relevant to our kids’ day-to-day life. About Samantha: Samantha Ettus is a work/life expert whose goal is to find the spark within each one of us and turn it into a fire. She is a best-selling author, a writer for Forbes, a sought after speaker, a Harvard MBA, and host of a nationally syndicated call-in radio show. Sam’s fifth book is The Pie Life: A Guilt-Free Recipe for Success and Satisfaction. Sam has shared her advice on hundreds of television shows and media outlets including The TODAY Show, Access Hollywood, NBC Nightly News, CNN, The Doctors, and Fox and Friends, and in The Wall Street Journal, The New York Times and USA Today.